The divine class has eight varieties, the sub-human has five and the human has one (only). Such, in brief is this creation. Objection: "The demons also should be mentioned." ... Proponent: No, because they are included in the above only. The demons are included because they were the gods earlier. The demons were the gods earlier. Moreover, because of their being Indra alternatively. 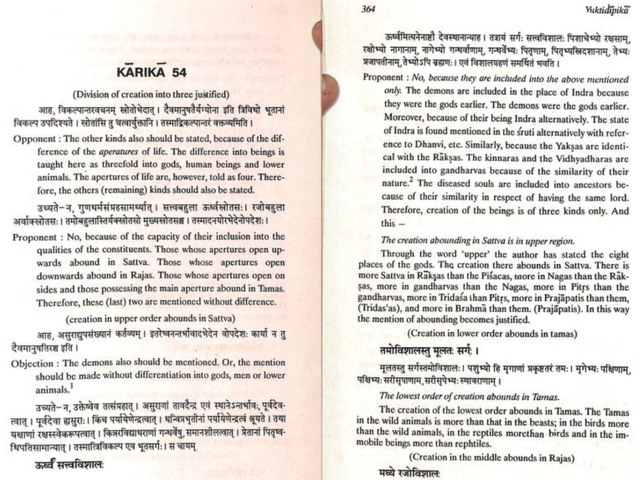 The state of Indra is found in the shruti alternatively with reference to Dhanvi, etc. Similarly, because the Yakshas are identical with the Rakshasa. The Kinnaras and Vidhyadharas are included into Gandharvas because of the similarity of their nature. The diseased souls are included into ancestors because of their similarity in respect of having the same lord. I find this reasoning somewhat tendentious, but I'm interested in the part in bold. My question is, what is the story of the Asura Dhanvi attaining the position of Indra? I've heard of other Asuras taking over Swarga, like Prahlada and Mahabali, but I've never heard of Dhanvi. What scriptures describe him? Is he mentioned in the Vedas as the Yukti Dipika suggests? Browse other questions tagged mythology vedas indra asuras sankhya .